I often encounter people I admire who seem extremely lucky in getting a great job, regular promotions, and seemingly unlimited professional success. For the most part, I believe these people earned this fate through taking responsibility for their luck. What I mean by taking responsibility is that they are doing the work necessary to be lucky in their careers. In psychologist Richard Wiseman’s book “The Luck Factor,” he studied thousands of exceptionally “lucky” and “unlucky” people. What he found was that those who considered themselves lucky tended to exhibit similar attitudes and behaviors. And those identifying themselves as unlucky tended to exhibit the opposite traits. His 10-year study revealed that good fortune is not primarily due to talent, hard work or intelligence. It is the attitudes and behaviors you have that can help determine how lucky you are in your career. Maximize chance opportunities and are especially adept at creating, noticing and acting upon these opportunities when they arise. Are very effective at listening to their intuition and do work—like meditation—that is designed to boost their intuitive abilities. Expect to be lucky by creating a series of self-fulfilling prophesies because they go into the world anticipating a positive outcome. Have an attitude that allows them to turn bad luck into good. They don’t allow ill fortune to overwhelm them, and they move quickly to take control of the situation when it isn’t going well for them. Wiseman recommends listening to your gut, being open to new experiences, remembering the positive in situations and simply visualizing yourself as being lucky. By actively practicing these principles, he says you too can find more luck in your professional growth and development. 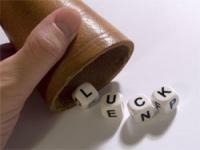 According to a survey from the professional networking site LinkedIn, 84% of professionals believe in career luck. And 48% consider themselves to have better career luck when compared to other professionals. These LinkedIn professionals attribute their luck to having strong communication skills, being flexible, acting on opportunities, compiling a strong network, and having a strong work ethic. The U.S. Bureau of Labor Statistics says 70% of all jobs are now found through networking. It seems obvious that the more you pursue the sort of people who can help you in your career, the higher the probability that you’ll meet them. Become more aware of what’s going on around you. The first step in any change begins with awareness. Not only of where you are, but who you are, and what you want to be. Practice mindfulness to be more conscious of the abundance all around you. Follow your passion and pursue those who fascinate you. Just because you’re doing one type of job, doesn’t mean you can’t talk to people outside of this niche. Don’t limit yourself just because you don’t have any experience or education in a certain field. If you’re passionate about something and have some talent in it, then find those who can help you nurture this. Open yourself to serendipity. A chance encounter is how so many great innovations and breakthroughs occur. Serendipity is the ability to take a chance occurrence—a surprising idea, person or event—and make creative use of it. Connecting the dots and seeing patterns can lead to novel ways of doing things and enterprising opportunities. Always be on the lookout and be ready to pounce. This is all about the preparation necessary to seize opportunities. It means having your elevator pitch always at the ready. And it means being able to pursue your interest when the right connections appear before you. Don’t count anyone out: see every encounter as potentially fruitful. You never know who you may meet who can help you take your career to the next level. Keep an open mind with everyone you meet to let them know what you’re looking for. Most people will want to help you if only given the opportunity. Seek out and listen to advice. Keep an open mind to others’ ideas and suggestions so you can expand your thinking. Learning should be a lifelong pursuit no matter where you are in your career. Ask questions and really listen in order to learn. Be nice even when others don’t seem receptive. Maintaining a positive attitude and showing appreciation is vital to attracting people and opportunities. People want to hire and work with people who are nice to be around. Make sure to demonstrate you are nice to be around even when it may be difficult to do so. Reframe the situation. Your perspective can influence events. Crisis can mean opportunity. Getting fired from a job that is not aligned with who you are can lead to your finding the job that is. I’ve always believed that if you raise any glass high enough, it will look half full rather than half empty. While acquiring knowledge, skills and experience are important to any career, luck also plays a significant role. And though many people think of luck as something passive that either happens or not, the lucky ones know it is much more active and requires work. So do what’s necessary to adequately prepare and remain open to see the opportunities in front of you. Then you’ll have luck on the side of your own career development.